Exceptional House Plans at the Lowest Price. Almost every home you see has a garage attached, usually tacked on to the front of the house. And as our cars get bigger, so too does the standard size of a garage. Spaces for three cars is not uncommon, and use of extra space for seasonal storage. Who could do without such space when building their dram home? A home seems almost bereft without the addition of a garage. Where else are we to park our cars, tuck away yard tools, and set up wood shop work benches? Providing an informal entrance to the home, often via a mud room or utility room, the garage is a frequently used, necessary part of many homes. But garages can be unsightly, awkward, or simply in the way of a carefully designed dream home exterior. Despite its many functions, the garage is arguably the least attractive part of your home’s exterior. Solutions abound for this particular problem. Garages can be tucked around the side of the home, be situated at the rear, or be built as part of the lower level of the house, completely removing the necessity of a separate garage. Yet other house plans hide the garage in plain site, including such design features as bay windows, small covered porches, and cottage-style landscaping features. Nearly every style of house plan offers solutions such as these. Clever garage designs abound in the MonsterHousePlans.com library, and by selecting both the style of home you are looking for and the rear-entry garage selection you will access a tailored search filter with hundreds of house plans with out-of-sight garages. Remember also, that any house plan design can be customized to your specifications with the help of licensed architects. Whether your dream home is lined with a Southern style wrap-around porch, a New England row of columns, or the handcrafted touches of a Craftsman home, a discreet garage enhances the curb appeal of any house. This entry was posted in Bungalow, Craftsman House Plans, Dream Home, Family Home, Floor Plans, Home Buying, Home Floor Plans, Home Floor Plans, House plans and tagged custom home plans, garages, hidden garages on February 28, 2017 by Admin. The cost of building a new home can seem daunting at the outset, but there are a number of clever ways to keep costs down without cutting any corners. Use of salvaged building materials is becoming a popular money-saving trick many builders and contractors are offering. Building materials and fixtures salvaged from old buildings first go through an evaluation process to ensure their quality remains intact. This deconstruction process can be quite lengthy but it often worth it in the long run when considering the reduced cost of materials. It is also a way to collect valuable old materials such as old growth timbers that are no longer available in other venues. In addition to the cost benefit, there is an environmental benefit as well, as using materials already designed for construction save in terms of both the time is takes to generate new materials and the time it takes to process them as waste. 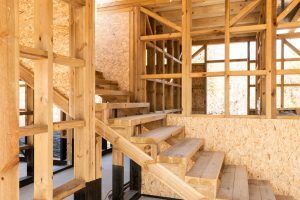 Salvaged building materials like beams, stairs, and framing supplies can save lots of money on home construction. More than just wood timbers are used in salvage projects. Fixtures such as door knobs, sinks, bath tubs, and hinges are frequently resold for use in new home construction, as are actual building materials like bricks, concrete blocks, insulation, roofing tiles, wall paneling, molding, and baseboards. Considering the vast array of building materials that can be purchased from salvage yards and resellers, much of the new home you seek to build can be constructed with these repurposed items. By using a combination of salvaged building materials and new, state of the art supplies, your dream home can be as unique as your family and be accomplished on a reasonable budget as well. Especially when considering the materials for low-visibility projects, look into salvage yards for low cost alternatives to brand new materials. It is important to work with a reputable contractor when purchasing refurbished building materials, or to buy from a credible retail location to ensure you are getting the highest quality. This entry was posted in Dream Home, Family Home, Floor Plans, Home Floor Plans, Home Floor Plans, Home Plans, House Improvement, House plans and tagged home construction, salvaged building materials on February 6, 2017 by Admin. Walkout basement homes are widely popular all across the country for the extra space and adaptability they offer. Although many imagine a perfectly flat, expansive lot on which to build a dream home, most lots present some degree of elevation that must be taken into account. Where possible, a walkout basement home provides a way to situate your home on such a lot without sacrificing any interior space. For many busy families, having living space on a lower level provides a necessary separation between active gathering spaces on lower levels and quiet, more formal rooms for mature entertaining upstairs. 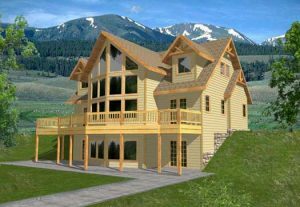 House plans with walkout basement foundations often include rec rooms, home theaters and gyms, and expansive finished storage space with built-in features to maximize space-saving habits. Guest suites are also common features of a lower level walkout basement house plan, providing a separate entrance and oftentimes a private patio or porch area for your guests to enjoy during their stay. Maximizing square footage without enlarging the footprint of the house is perhaps the most beneficial feature of a walkout basement floor plan. A single story home can still have a fully finished lower level, visible only from the back of the house and providing covered deck space below. These types of plans are often the perfect choice to enjoy a rear-facing view, or when the home is situated on a lot so as to create an expansive backyard area. For the ultimate in home amenities, consider an elevator connecting the two floors or a lower level summer kitchen and BBQ porch to ensure seamless connection between separated floors and outside gathering spaces for the whole family to enjoy. While the curbside view of a walkout basement home shows perhaps a modest single-story house, the rear of the home reveals two levels or more, with inside spaces connecting with outside spaces through skilled use of windows, porches, and patios. This entry was posted in Craftsman House Plans, Dream Home, Family Home, Floor Plans, Home Plans, House plans, Outside Spaces, Small House Plans and tagged rec rooms, walkout basement on January 30, 2017 by Admin. Inverted floor plans have a long history of providing functional protection. Recent construction innovations and clever design trends have brought this practice back to the forefront of home floor plans in a variety of settings. Perhaps the oldest examples of inverted floor plans are the castles of ancient Europe. A design of concentric circles- the outer moat, the stone wall surrounding the grounds, and stacked structures ending with the Castle Keep, offered several layers of protection from invading enemies. This innermost tower, the castle keep, was typically where the family slept. It also provided, one supposed, the best and most expansive views of the kingdom. 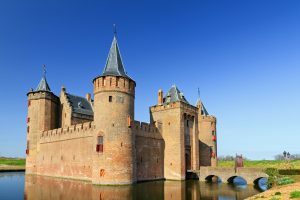 Castles were some of the first inverted floor plans, with sleeping quarters on upper floors for safety and warmth. Fast forward to a more modern view of the world, in which single family homes dominate the landscape. Early examples of this show homes built around a single multi-purpose room, used for sleeping, cooking, and as a gathering space for the family. Families that could afford a slightly larger home would often position a loft above this main room to use as sleeping quarters, where the rising heat from the central fire would maintain warmth through the cold nights. In today’s world, this natural vertical progression has lead most home plan designers to place bedrooms on the upper floors, and living areas on the main floor. And while there are some stylistic deviations, such as a first-floor master bedroom, many styles of house plans accept this template. And it works for many families. Regional construction, however, has kept the inverted floor plan alive and well. In coastal areas, the low country lots, and areas where rising river levels threaten the foundation, inverted floor plans make the best use of space. A view-driven plan will often feature main living areas on the highest levels of the home, in order to see above a neighbor’s house or over the tree line. In hot and humid places, these upper floor are uniquely able to capture breezes while discouraging pesky insects who tend to congregate at lower altitudes. Roof decks make the most of seasonal weather. It is no surprise then that most of the inverted floor plan models you see are either Coastal house plans, Beach house plans, Florida plans, European house plans, and Modern or Contemporary floor plans. But an inverted floor plan is for more than just coastal properties. Even the more traditional house plans can make use of this design, as many of them draw from European design concepts. 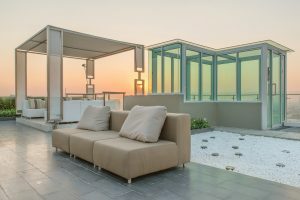 Modern designs are beginning to make use of this feature as a way to make the absolute most out of available space, including outside areas like roof decks and balconies. And with modern amenities like elevators and dumb waiters, the logistics of spending most of your time on the upper floors are simply settled. There are a number of factors that make an inverted floor plan the preferred choice for many families and builders. Whether its intent is to access sweeping views, to capture cool breezes, or to elevate the main gathering spaces for maximum light and openness, the inverted floor plan has evolved into one of the most efficient use of space available. This entry was posted in Craftsman House Plans, Dream Home, Family Home, Floor Plans, Home Plans, House plans and tagged first floor master, inverted floor plans, modern floor plans on January 15, 2017 by Admin. Building your dream home is often a very exciting process. As you witness each phase of construction you draw ever closer to the completion of your goal. But there can also be moments of uncertainty: did I choose the right home for my family? What if things change in a way I haven’t foreseen? No one is better suited to anticipate the future needs of your family than you are. Even though you are uniquely qualified for this decision, unexpected changes occur in the life of a dynamic family. Having the ability to meet those changes head on provides a welcome comfort. For many families, the best way to mitigate this anxiety is to choose a house plan with built in expansion options, or flex space. The cost and headache of building an addition on to your existing home can be dissuasive and discouraging. The perfect house plan for today’s changing family dynamic will include spaces for growth that can be finished at a later date when the need arises. House plans with unfinished basement levels offer open space that can be defined in any way your family needs, or can be left open for a generous rec room, storage, or craft space. Yet other house plans include the structure for additional bedrooms, kitchens, bathrooms, walk-in closets, and outdoor patios for an easy transition from flex space to living space. Whether planning for your aging parents or in-laws to move in, or transitioning into a work-from-home or self-employed arrangement, or the knowledge that your young children will one day want their own bathroom: having undefined space built into your dream home offers growth potential with ease. Life is full of exciting opportunities and unexpected moments of change. The feeling of having flexibility on your side makes it easy to meet those opportunities with a positive outlook. A custom home plays a large role in terms of meeting the future needs of your family. By harnessing your unique ability to predict upcoming needs and changes, and including space for the unforeseen, your house plan can serve you for many years to come. 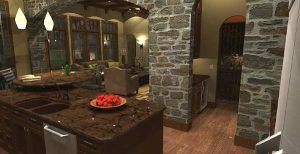 This entry was posted in Craftsman House Plans, Dream Home, Family Home, Floor Plans, Home Floor Plans, Home Plans and tagged bonus room, expansion space, flex space, in-law apartment, teenagers, work at home on December 22, 2016 by Admin. There is perhaps no season that makes many of us nostalgic for early American architecture like autumn. 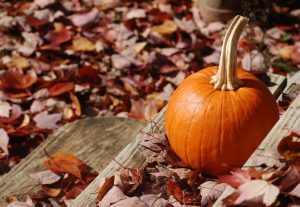 As leaves begin to turn bright colors and fall in piles in the front yard, kids dress up and parole neighborhood streets for Hallowe’en, and preparations are made for the upcoming holidays, images of colonial homes fill our heads. Those wide front porches decorated with carved pumpkins and hardy mums in pots; lights going up along roof lines; chimneys filling the air with wood smoke….these sensory moments are part of what makes this season so special and culturally historical. 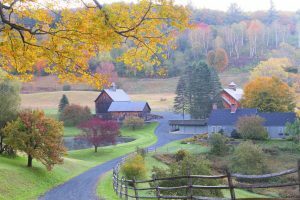 A nostalgic American landscape makes for the ultimate autumn landscape and puts us in mind of the approaching holidays. When we enter the season of hosting for the holidays, there are some styles of homes that are designed for this time of year. And it’s those nostalgic American home styles that do it the very best: Colonial, Plantation style, and Country homes are among the most perennially popular. Especially as the season turns cold, those homes that offer multiple fireplaces, large gathering rooms, and guest accommodations are especially sought after. And for large families, no holiday would be able to come together without some sort of play room or bonus space on the lower floors to which the children can be sent while meal preparations are under way. As adults grow their families and develop traditions, it’s only natural to consider how your family gathers together. 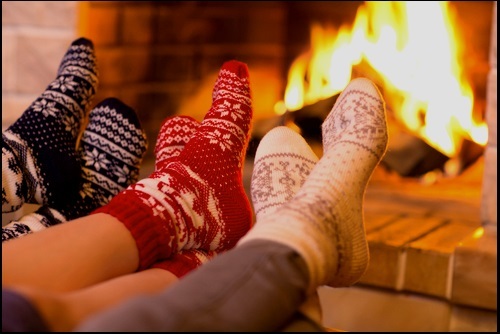 In the midst of holiday craziness and unpredictable weather, how to spend time with your loved ones? These are some of the most important considerations when searching for a house plan for your dream home. Are you building far from other family members, where you might need to host overnight guests from time to time? Do you prepare large meals and require ample storage and counter space to work your masterpieces? Is quiet time around the fireplace the best part of your night? As you search through our curated collections of house plans for holiday hosting, keep in mind the spaces in which you want to see your most beloved traditions to take place. Whether your hang lights, or decorate with autumn colored leaves, this holiday season is shaping up to be a wonderful time for all to get together and revel in the joy of a life well lived. This entry was posted in Craftsman House Plans, Dream Home, Family Home, Floor Plans, Home Buying and tagged autumn, colonial house plans, country house plans, holidays, plantation house plans, seasonal on November 4, 2016 by Admin. Autumn is upon us, and it appears in all its colorful glory. It is the time of Hallowe’en costumes, darker days, pumpkin flavored everything. This time of year, we showcase our beautiful homes and extend our front porch space to friends and family alike as we welcome them to our homes for a string of holiday get-togethers. Front porches are even more welcoming with festive fall decor. Whether you have a walkway to your front door or a covered front porch where guests can take shelter from stormy weather, a visitor’s experience in your home begins with curb appeal. Those few moments between leaving the car and arriving at your door are filled with observation and the slow exposure to your cultivated environment. 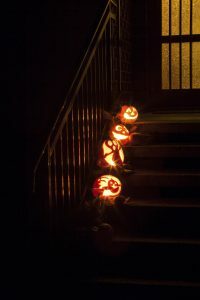 Carved pumpkins line the steps of this spooky front porch. yard is not only functional, but can highlight design and landscaping features. Trees known for spectacular fall foliage make grand statements as well. The focus on the front yard this time of year highlights house plan features that might otherwise go overlooked. A front porch, for many, is an intentional aesthetic that represents the style of the homeowners. But why beautify the front of your home just for visitors to enjoy? Some of the most perennially popular house plans feature large windows in the front façade, serving both as a welcoming openness to guests and to offer a view of the front yard from home offices, sitting rooms, and salons. 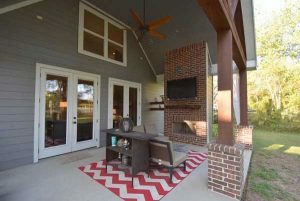 House plans featuring wide covered patios or wrap around porches encourage year-round enjoyment. Enjoy your front porch and yard with a house plans that features lots of front-facing windows. Your front porch and yard are an extension of your home, and reflect your unique style. 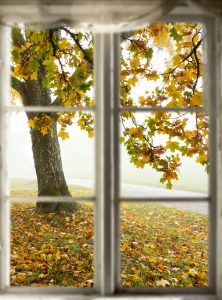 Changing seasons offer us the chance to highlight the gorgeous features of our homes. Whether your family is holiday-driven or more classic in style, this is one area where “keeping up appearances” is an extension of welcome and graceful hosting. This entry was posted in Dream Home, Family Home, Floor Plans, Home Plans, Outside Spaces and tagged autumn, front porch, front porches, Halloween, house plans on October 28, 2016 by Admin. The storm season is upon us! For those of you who welcome the return of the Storm Watching Season, you know first-hand the value of certain house plans with features that make cold weather easy to enjoy inside a safe and cozy home. Whether you live on one of the coastlines or make your home on land located somewhere in between, winter is full of dynamic and intense weather systems that move across our landscapes with startling regularity. There are some obvious weather concerns that an architect and a builder will pay close attention to: proximity to tide-affected water, for example, or a lot in hurricane-prone areas will inform many of the structural decisions to be made when building your dream home. In fact, this is one of the major reasons families opt to build from custom house plans rather than buy a pre-built home: it is a precious opportunity to cater the needs of your family to the demands of your specific region. But even beyond these important concerns, there are smaller details to think about that are no less important as we head into the rough weather and low temperatures of a North American winter. When searching through house plans of the various homes that catch your eye, also think about the things that help you to feel safe when some of your amenities are unavailable. The keeping room in this house plan serves a gathering place for busy families. Many house plans include a keeping or hearth room adjacent to the kitchen. These rooms typically have a wood burning fireplace and an open space in which your family can gather when the rest of the house is a bit chilly. These keeping or hearth rooms were a staple in early American Southern-style homes. The keeping room is an informal and cozy space; often these are rooms with few electronic devices and plenty of comfortable seating. Outdoor kitchens provide cooking alternatives when the power goes out during storm season. Not just for summer bbq’s, a built-in outdoor kitchen is typically an enclosed space to keep out inclement weather and regulate temperature and ventilation while cooking. If you live in a place where electricity can go out for extended periods of time, having an alternate place to prepare meals and still be protected from the elements can make all the difference when in the midst of a storm. A non-electric grill is typically built in to these outdoor kitchens, but wood burning fireplaces are also common additions. Dress up your fireplace with a cooking grate and a roasting spit from which to hang a pot of steaming soup and you’ll hardly even notice when the lights come back on! Wrought iron gates at the entry of the walk-in pantry lend an artistic flair to this breathtaking kitchen. When the bad weather warnings come, many families feel the need to stock up on essentials. 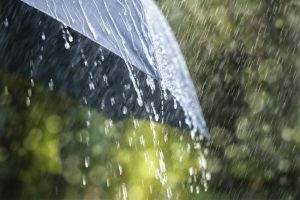 Whether you preserve a seasonal harvest or head to the local shop for canned soups and bottled water, having these necessities on hand helps everyone feel more at ease when facing a stormy season. A generous pantry provides lots of space for your supplies and makes keeping track of what’s on hand a cinch. This entry was posted in Dream Home, Family Home, Floor Plans, Home Plans, House plans and tagged butler's pantry, house plans, keeping rooms, kitchen, outdoor kitchens, storm season, walk-in pantry on October 20, 2016 by Admin. The term California Bungalow refers to more than just an architectural style. Referencing a time and place in American history, the classic California Bungalow home design reflects an early stage in the development of the American Dream. 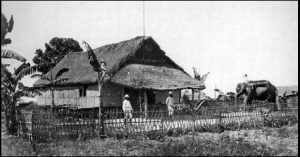 A Bengal Bungalow in 1865 belonging to a British military commander. Bungalows have been built for centuries overseas, primarily in the Bengal region of India, where the term originates. Popular with British commanders, the traditional thatched-roof home style was adapted to house the military elite and influenced house design across the world. The bungalow’s first appearance in the United States was on the East Coast but it was the fledgling state of California who greeted this modest design with open arms. In the early days of the 20th century, California was a happening place. Between 1920 and 1929 the population of Los Angeles more than doubled, partly due to a tremendous influx of immigrant families finding work in growing industries. Hollywood was generating more than income; it was mass producing and disseminating American culture. An oil boom is largely responsible for placing California as the largest player in the aviation industry, the home of several large banking corporations, and the beneficiaries of an explosive real estate market. As the population increased middle class American families who, up until this point, had largely rented city apartments were enabled to move outward into the wide and undeveloped lands beyond the urban city center. California Bungalow homes, with their one-story designs and open floor plans, were affordable to build and maintain. Because the homes were small, even a modest lot offered a yard space, typically in the back of the house. In previous years home ownership was mostly relegated to the wealthy, and the designs reflected this opulence. Servant’s quarters, formal spaces like sitting rooms and parlors, and expansive guest suites characterized the luxury homes of the well-off. The introduction of the California Bungalow home, however, brought home ownership down to the level of the successful working class American family. Materials came from local surrounding areas and prioritized stucco, wood shingle, or horizontal siding instead of the early brick versions seen on the East Coast. Redwood beams became a common style characteristic. 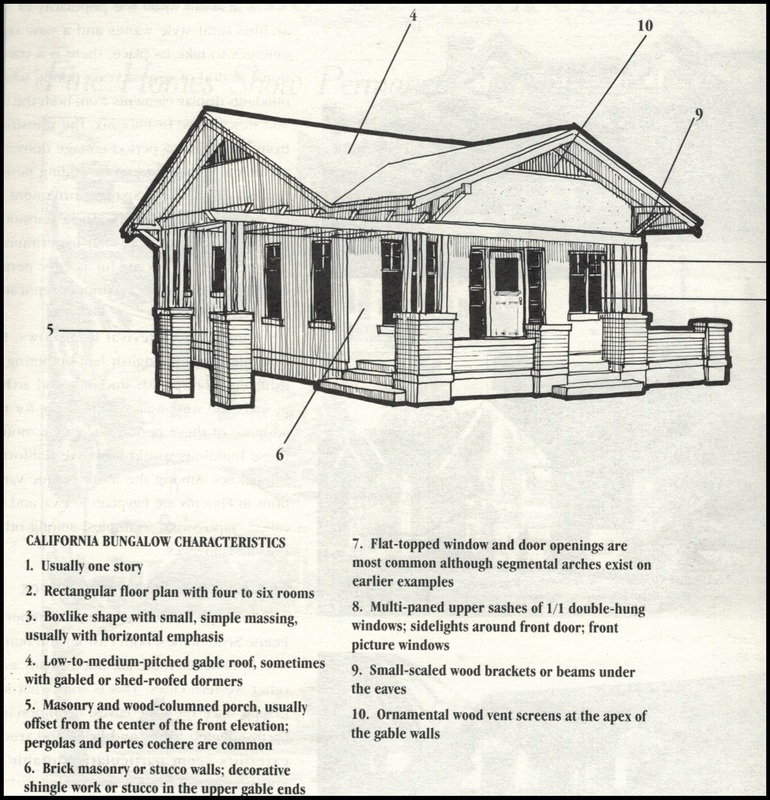 Sometimes sold in ready-to-assemble kits, one could even purchase a bungalow home from the Sears and Roebuck catalog! By the end of the 1930’s, the California Bungalow style was on the decline. As Americans recovered from the war and the G.I. Bill helped returning soldiers build a sustainable life, the development of the suburbs saw homes getting larger and larger as American culture swelled towards opulence once again. In today’s modern world of technology-enhanced experiences, dense urban populations, and multi-tasking families, the Bungalow home is seeing a resurgence. Bungalow floor plans typically place a large gathering space at the center of the home with the other rooms organized in a connected constellation around it. This open, casual feel is widely popular with families looking to balance out the distractions of the world with a home that brings family members together and integrates everyone’s living experience. This modern California bungalow home boasts elegant efficiency with a nod to the classic historical design. An early piece of American cultural history, the California Bungalow is sturdy and adaptable home that has already proven its worth against the shifting tides of sociocultural change. 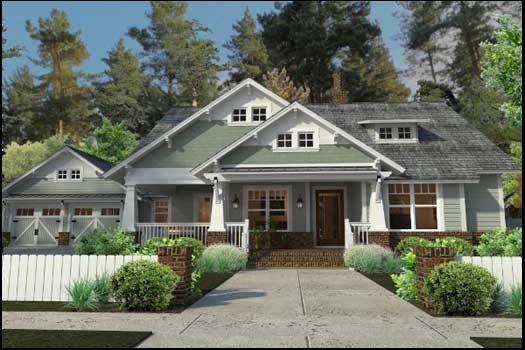 This entry was posted in Bungalow, Craftsman House Plans, Dream Home, Family Home, Floor Plans, Home Plans, House plans and tagged Bungalow, Bungalow House Plans, California Bungalow, dream home on September 23, 2016 by Admin. Among the trends in contemporary home design is a return to “the Old Ways”, and families are once again including a keeping room in their modern house plans. For Colonial houses, architecture was highly focused on function over aesthetics. Life was hard, seasonal weather changes caused major shifts in lifestyle, and the demands on early American settlers were high. Houses at that time were highly influenced by English and European trends, but materials were limited to what could be found nearby and luxury was a thing of imagination. These sturdy folk built homes to withstand intense weather; exteriors favored stone and brick, and the floor plans only included what was absolutely necessary- usually small homes designed around a central keeping room. Excess in design would not come until many decades later, when affluence begins to gain footing American culture. An early Colonial-style home in Pennsylvania. But in these early years homes were sparse and industrial, providing shelter and warmth and working space for families who toiled relentlessly, often in conditions unimaginable to us now. Modern house plans have evolved in countless ways and show the influence of the wide world we now live in. Creativity has taken hold in architecture, and our homes reflect the freedom to imagine and to design spaces with aesthetics in mind, instead of mere function. In many parts of the country those old Colonial homes still stand, and we can look to them for inspiration. As modern life gets more and more hectic and divided, we see a hearkening back to the way people lived before all this distraction started affecting our families. Among the many trends in contemporary home design is a return to “the Old Ways”, and families are favoring a nod toward simpler times and natural architectural features. We see this demonstrated strongly in the return of the keeping room to modern house plans. 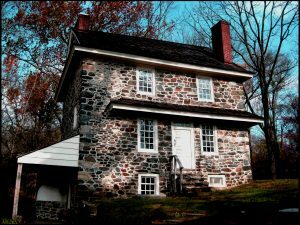 The keeping room served as a gathering place for busy families in early American colonies. The keeping room originated in the late 1700’s. 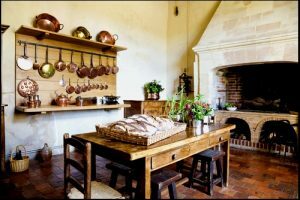 Located just off the kitchen the keeping room, or hearth room, featured a large fireplace and was often the only room in the house to be heated. It served as a gathering place for inside work and food preparation. During cold winter months, inside chores would be done here, and often families would all sleep together by the hearth for warmth. In larger Colonial homes, older children would often sleep in an upstairs attic, located above the keeping room, where the heat from the fire would warm the room upstairs. 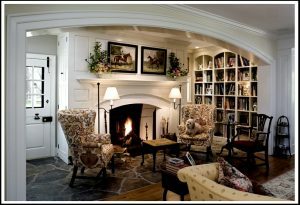 While design ideas are infinite, the one element that traditionally makes this space a keeping room is a fireplace. In contemporary homes, the keeping room serves still as a gathering place for families often divided and multitasking. Also useful for those who have a tendency to entertain, the keeping room acts as a spill-over space for guests who naturally gather in the kitchen while final meal preparations are being seen to. For families with school age children, this room can be a place where homework is finished and school projects are completed. With its close proximity to the kitchen and, often, to other rooms in an open floor plan, this space is well connected to the rest of the house, providing a feeling of inclusion and comfort. This is typically a space of coziness and simple decoration. Many families choose to have this room be (relatively) technology free; the flat screen, media equipment, gaming consoles, and other screen activities are often placed in other rooms, like a family or game room. Instead, the keeping room will typically be focused on conversation or relaxation. A subtle docking station for music players might be the only tech gear present. Overstuffed arm chairs and a wide, low coffee table encourage a coffee break hangout; simple slip-covered parson’s chairs, bookshelves, and occasional tables make a perfect after-dinner gathering space. Even a small space can provide comfort and relaxation. The key to the keeping room is that it is a flexible space intended for people to move through and about the room as comfort indicates. Avoid clutter and complex décor, and opt instead for comfy, casual, easily approachable embellishments. This is a room that can be designed entirely based upon how you use it, so feel free to break the so-called rules. Do what feels comfortable to your family. This is a place that should draw people towards it, so go with comfort over exhibition. A keeping room often becomes the center of a household, anchoring family members to a core gathering space. To get started, use the Advanced Search option to filter house plans with keeping room or hearth rooms already included. Don’t see one you like? Talk to the architect about the plans you like; many bonus rooms and flex spaces can be adjusted to easily adapt into a keeping room to give your modern dream home a touch of the Old Ways. 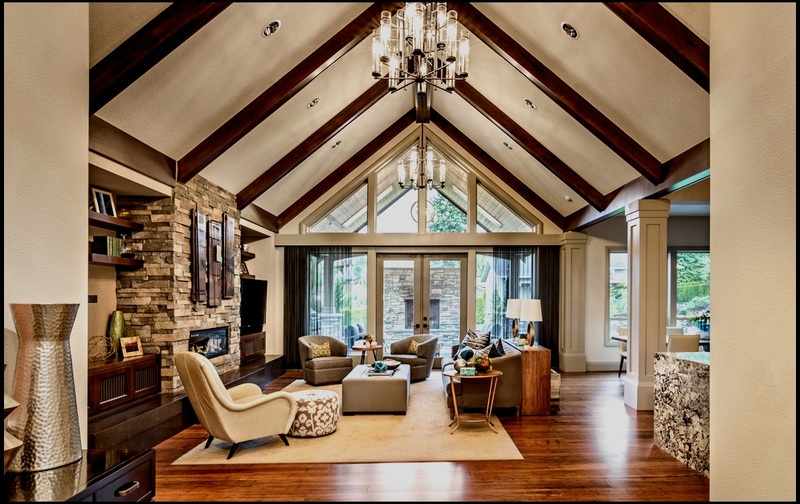 A contemporary keeping room uses natural stone and exposed beams to balance the light from big windows. This entry was posted in Dream Home, Family Home, Floor Plans, Home Floor Plans and tagged colonial architecture, dream home, house plan, keeping room on August 26, 2016 by Admin.